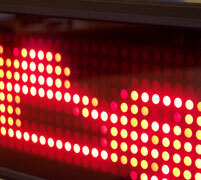 Set aside from the majority of the LED message display market, with a low 35mm profile and distinctive 75mm (10 LED) maximum character height, the rugged, light-weight i-show is uniquely placed. The 99 messages of up to 240 characters also store individual font, animation and display settings. Representations of the i-show animations can be seen at the foot of the page. Information from around the World – the i-show serial utility also offers the fantastic ability to display RSS internet and intranet news and information feeds from around the world, keeping you, your customers, or your employees instantly up-to-date. Low-cost LAN adaptor, interport, COMING SOON! 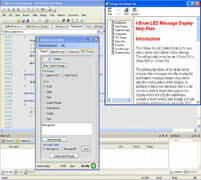 – send your messages to the i-show across a computer network or the internet, expanding the control available to the i-show. Ideal for industrial or large office applications. network (LAN) Adapter – Coming Soon!